The armadillo’s Prophecy is based on the graphic novel of the same name by zerocalcare. 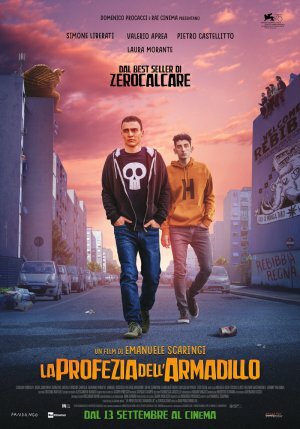 It tells the story of ZERO, a twenty-seven year old guy who lives in a peripheral Roman suburb of Rebibbia, Tiburtina valley, a small paradise squeezed between Tburtina and Nomentana. Mammuth Land, shell suits, imprisoned bodies and big hearts. Nothing’s there but nothing’s needed. zeRO is an illustrator, though not having a stable income, he copes by tutoring french, timing how long people queue for at the airport and doing illustrations for independent punk bands. his life is very repetitive, days spent on public transport traveling across Rome to get to his various jobs, going to see his MOTHER and coming back home, to find his critical conscience in the form of an ARMADILLO, in flesh and blood, or rather, plates and soft tissue, with whom he has conversations bordering on paradoxical during which he updates him on what’s happening in the world. Keeping him afloat in this hard-knocks life is his childhood friend SECCO. Upon hearing the news of CAMILLE’s death, a french girl he never had the chance to confess his love to, him and SECCO look for GRETA: a friend they haven’t seen in ages with whom they plan to share the tragic news to then go together to CAMILLE’s funeral in france. The loss makes ZERO reflect on his life up until now and confront his irreverent spirit about the incommunicability, doubts and uncertainties regarding his generation of outcasts.